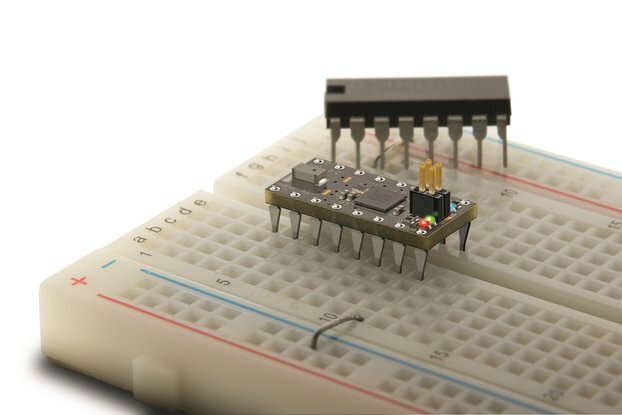 IC pins for your own projects. 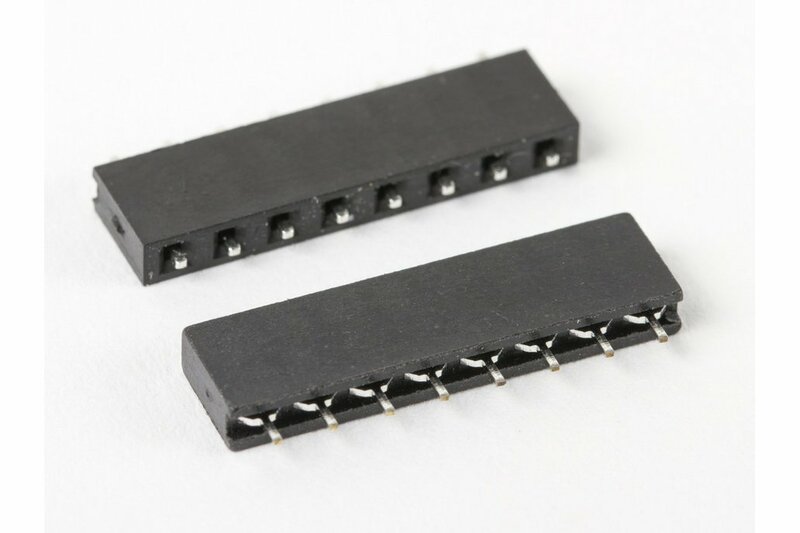 Flip-Pins are the third generation of the Integrated Circuit (IC) pins designed by Fliptronics for use in products like OSHChip. 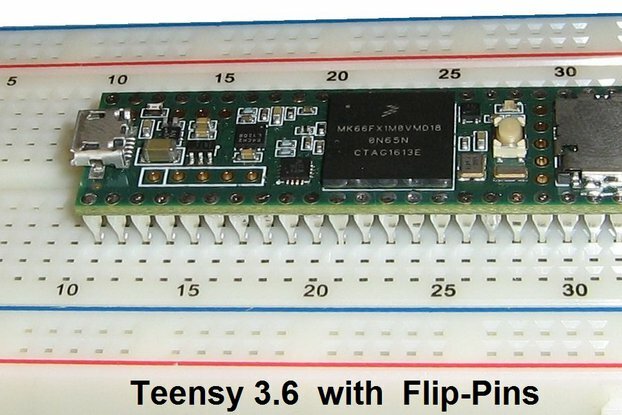 The goal for Flip-Pins was to create pins that could be soldered into a Printed Circuit Board (PCB) and to look as much like an IC pin as possible. (Current production OSHChips use the second generation pins, and will change over to third generation with the next production run.) With the unique plastic aligner, the pins are held 0.100” apart, with a 0.062” solder tail exposed. 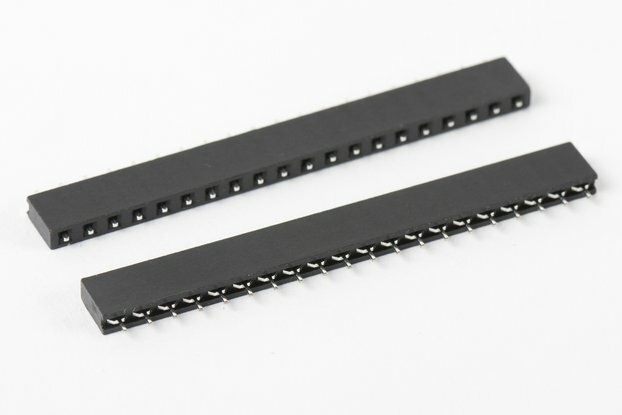 A significant feature of Flip-Pins is that their width (0.020”) is the same as traditional Dual-Inline-Package (DIP) IC pins, and so Flip-Pins are directly compatible with standard Breadboards. 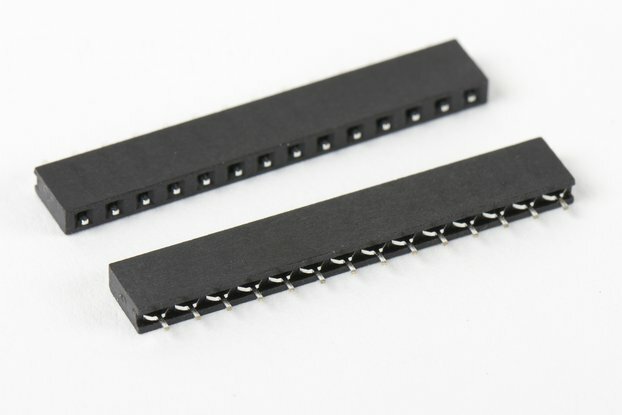 Many people use header pins which are square to connect their PCBs to breadboards, and are unaware that header pins damage the breadboard because they are wider than standard DIP pins. PCBs that use Flip-Pins are easier to insert and remove from breadboards, compared to PCBs with header pins. Flip-Pin are available in 3 lengths: 8, 14, and 20 pins. Other lengths can be achieved by either using multiple strips, or removing pins from a strip. CAD libraries for Altium, Kicad, and Eagle. The Altium and Kicad libraries include 3D models too. Examples of compatible Solderless Breadboards and IC Sockets. As I was creating OSHChip, I received many compliments and queries about the pins I use. Almost as many queries as there was for OSHChip. Lots of people wanted to buy them for their own projects. Unfortunately, the cost of the original pins I developed were quite expensive, and required a complex CNC machined brass fixture to hold the pins in alignment for soldering into OSHChip. It was like trying to thread 16 needles all at once. 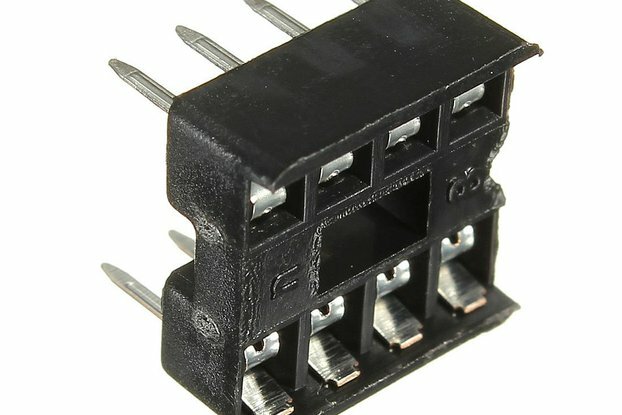 I had a solution, but it was expensive per pin, and the fixture was expensive too. I struggled for about 6 months trying to figure out how to make the pins cheaper, and MUCH easier to work with. The result is Flip-Pins. They are about 1/2 the price of the original pins, and they are easy to work with, both at the hobbyist level in small quantities and also in larger quantities with Electronic Manufacturing Services (EMSs). Flip-Pins are so special, they are unique. 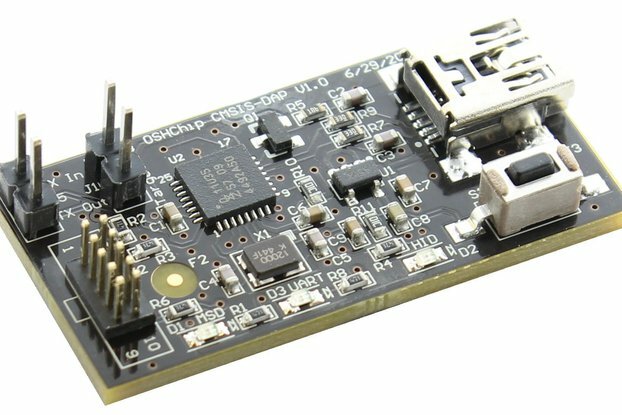 Flat Rate shipping for any quantity of OSHChip_V1.0 or OSHChip_CMSIS_DAP_V1.0 ---- No tracking ---- California buyers please add 8.75% sales tax.